Companies offering audio streaming services grow daily,and the services are increasing as well. With audio streaming services, you get access to millions of songs from your mobile device, your PC or your sound system at home. You only have to pay a monthly flat fee,and you get access to millions of songs. The flat rate paid gives you additional features like creating your personal radio, reading reviews about the latest releases and creating and sharing your playlist. 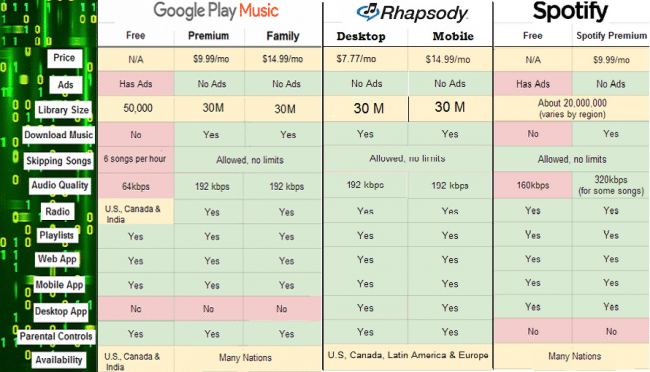 However, with so many streaming services available today, it is tough to decide which one is best for you. All of them might offer similar services,but they have more differences than similarities. 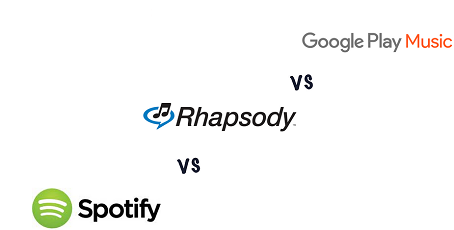 Google Play Music, Spotify and Rhapsody also known as Napster are some of the music streaming services out there. Let’s take a look at the three and see which one is stronger than the other and at what. This is one of the best music streaming services on the market today. It has the combination of a vast music library with more than 30 million songs reaching more than 58 countries and an excellent user-friendly interface. The app also has great features and wide support of devices making it the first choice for most people. Spotify has a mobile app for Android as well as iOS platforms. They also have their own desktop software for Windows and Mac OS. The desktop software once installed scans your folders and imports playlists from the Windows Media Player and iTunes, such that you can play any tune from your local servers or the Spotify ones. If you are not sure if Spotify is the best option for you, you can create a free trial account to test it. If you are the free music kind of person and you can’t pay to listen to music. Spotify has a free version of the app but it is limited to low-quality audio,and you also have to put up with a lot of ads with some playing in between tracks. This was the only name that meant something in music streaming 15 years ago,but today, the company is owned by Napster and has been overtaken by other music streaming services. It is however existent and pretty good. It offers an extensive song library with more than 30 million songs today, a fantastic user interface and good mobile device support. One of the best things about the service is the possibility to buy numerous songs as MP3 files. Napster is compatible with a huge selection of home audio receivers and systems too. Napster has a mobile app for Android, iOS platforms and more as well as a windows desktop application. This is one of the best-known music streaming services and its app comes pre-installed on most of the Android smartphones. It has a vast music library with more than 30 million songs and an unlimited amount of time to stream. With Google Play Music, you can upload music from your own library and share the same with others via Google+. It also has a colorful user interface as compared to it’s rivals and offers an easy to use experience with most of its functions available within one or two clicks. Google Play Music All Access- $9.99/month with all features plus the Standard package and the first 30 days are free. Google Play Music Standard Free- store your own songs up to 50,000 in your locker and you can access them anywhere.